The common cold is actually an infection of your upper respiratory tract and it is caused by a virus. It may not be life-threatening but it sure feels that way at times. Having a weak immune system makes you more prone to suffering from a cold. Luckily, there are so many immune-boosting foods that can considerably reduce your risk of catching one. Consuming these foods when you already have the infection is also a good idea as it may help you in bouncing back from it quickly. So if you’re geared up to keep the common cold from ruining your day, read on. Below are some foods that can ward off the upper respiratory tract infection as well as significantly make a bout of it shorter. It’s a fact that citrus fruits such as oranges, lemons and grapefruit are loaded with vitamin C, a nutrient that helps in making your immune system strong. These fruits are also packed with flavonoids — plant pigments with superb antioxidant properties that are said to help shorten the duration of the common cold. Rejoice if you are fond of spicy foods and you have a cold. The consumption of spicy foods makes your nose run, thus helping to provide relief from a stuffy nose. It’s no secret that spices help bolster the immune system. So whether or not you have the common cold, go ahead and enjoy spicy foods. No one really knows why a serving of chicken noodle soup can reduce the symptoms of a cold, but who cares? What matters is it works so well. 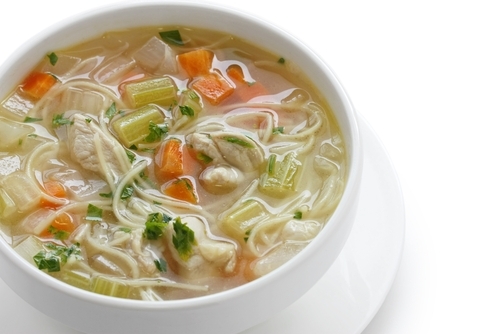 Scientists believe it’s the merry mix of vegetables in chicken noodle soup that makes it good at dealing with the common cold. Also, it boosts your fluid intake, something good for someone with a cold. It’s a wonderful idea to opt for foods that contain garlic and onions when you have a cold. That’s because both of them are revered for their superb antimicrobial properties. They also make your immune system stronger, thus reducing your risk of getting the infection. Garlic most especially helps in opening the sinuses and draining them. Drinking ginger tea during a bout of cold can help in different ways. First, it soothes an itchy throat that usually accompanies the common cold. Second, ginger has anti-inflammatory properties that relax the airways, making it easier for you to breathe. Third, it provides mild pain relieving and sedating effects. Taking a tablespoon of honey when you have a cold can work wonders. That’s because this golden-colored syrup has phenomenal antimicrobial properties that help kill off the virus behind the upper respiratory tract infection. It also soothes an irritated throat caused by a cold. However, honey should not be given to kids below 1 year old. Because it contains billions of friendly bacteria, eating yogurt helps in strengthening your immune system. Try to steer clear of flavored yogurt. Instead, top a plain serving with fruits like blueberries or sliced bananas or kiwis. With the addition of antioxidant-packed fruits, yogurt becomes an even more potent cold-fighting treat.